We would LOVE to host your birthday party, family picnic, work outing, or other event! We have 3 party rooms available to rent for parties/events. 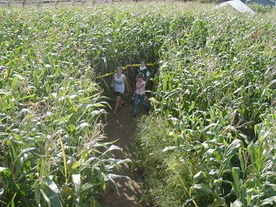 These party rooms are cut into our main corn field which houses the larger of our two corn mazes. Our whole farm is open air - there is no indoor party venue! Each party room is supplied with a canopy, picnic tables and a regular folding table (all covered in a plastic table covering). When scheduling your party we do suggest picking a raindate since the weather in New England is so unpredictable. Our available weekend party times are 11 am, 1pm, and 3pm. On Fridays and Saturdays in October, we do have the ability to book parties at a 5pm time slot, since we are open later on those nights for our flashlight mazes. Birthday Package #1 – Includes admission for BOTH large mazes for 15. A Foster Farm Party Host is included for your celebration in a private party area within the maze. Admission includes all farm activities. A sugar pumpkin is also included for each child. The cost is $200. Additional children $9.00. Birthday Package #2 – Includes admission for BOTH large mazes for 25. A Foster Farm Party Host is included for your celebration in a private party area within the maze. Admission includes all farm activities. A sugar pumpkin is also included for each child. The cost is $275. Additional children $9.00 each. Courtyard Party - Age 3 and Under Birthday Package- Includes the play area only: mini maze, hayride, playscapes, pedal carts, and animals. Cost for this package is $30.00 for the party room per hour and a half rental and $5.00 per person 4 and older. Sugar pumpkins are available for $2.00 each. Deposits of $50 are required for all party reservations. Checks payable to Foster Family Farm. Call to reserve your party date today at 860-648-9366! *Each group of students in the maze MUST be accompanied by an adult chaperone. There is a $500.00 dollar fine for any damage or vandalism to the maze or maze structures. * - We have a strict no tolerance policy. Violators of maze rules will be asked to leave immediately.